Bernard King was chosen in the second round of the 1977 NBA Draft by the New Jersey Nets and averaged 24.2 points per game to make the All-Rookie Team. A 6-foot-7, 205-pound forward, King was traded to the Utah Jazz in 1979, but missed most of the season with a severe knee injury and was sent to the Golden State Warriors. King was named Comeback Player of the Year after averaging 21.9 points a game in 1980-81. Golden State traded him to the New York Knicks in 1982. With New York, King led the NBA in scoring with 32.9 points a game in 1984-85. King suffered yet another serious knee injury in 1985, but worked his way back into form by the time he joined the Washington Bullets in 1987. Over the course of his career, in just 874 regular season games, he scored 19,655 points, an average of 22.5 per game, and he added 687 points in 28 playoff games, a 24.5 average. In 2013, he was elected to the Naismith Hall of Fame. 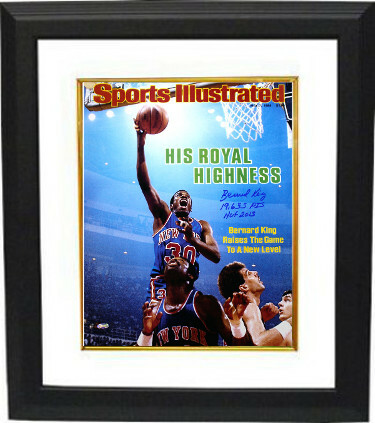 Bernard King has hand signed this New York Knicks 16x20 Photo Sports Illustrated Cover from May 7, 1984 with dual 19,655 Pts & HOF 2013 inscriptions. Steiner Sports Hologram and Certificate of Authenticity. Custom White Mat and Premium Black Frame as shown.